Think you know the truth about how our world works? Matt Brown is here to blow away your long-held beliefs with his illuminating look at the many myths, legends, and misquotes that have shaped our perception of Earth. Convinced Earth is round? It’s actually flatter at the poles. Think the Sahara is the biggest desert on the planet? It’s actually Antarctica. 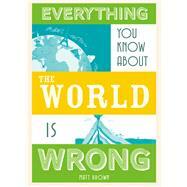 Matt Brown will astound you with some surprising truths about geography, nature, cities, and the people who live there. He guides you through a minefield of misinformation as he answers questions about whether we could solve overpopulation by colonizing space, why you shouldn’t measure earthquakes on the Richter scale, how the Mayans got it wrong when they predicted the world would end in 2012, and how a heatwave in 2003 led to a worldwide shortage of wine. Matt Brown has been a scientific editor, writer, and event host, working for Reed Elsevier and Nature Publishing Group. He served as the Royal Institution’s quizmaster, and has also put on science quizzes for the Royal Society, the Manchester Science Museum, and the Hunterian Museum. Matt’s previous books include Everything You Know About London Is Wrong, Everything You Know About Art Is Wrong, and Everything You Know About Space Is Wrong (all Batsford). He remains Editor-at-Large of Londonist.com.